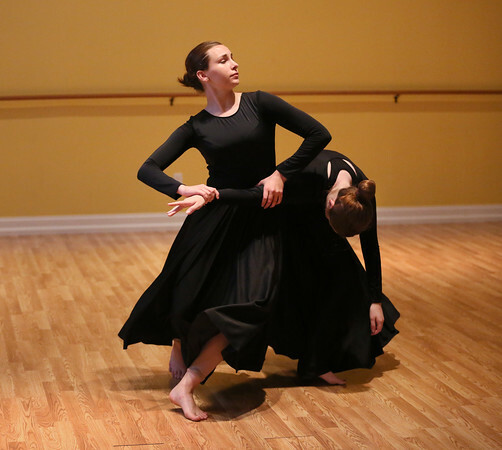 Fourteen-year-old Lainey Turner, left, of Gloucester and Madison Poore, 18, of Hamilton perform "Tabula Rasa," a modern contemporary dance piece choreographed by Kimberly Blisard, artistic director of the Cape Ann Center for Dance, during rehearsal recently at the CACD studio in Gloucester. Thirty-two dancers, ranging in age from 11 to 18, perform in "Tabula Rasa," which will be one of the featured pieces in the CACD's recital this Sunday at 3 p.m. in the Manchester Essex High School auditorium in Manchester. The public is invited to attend the event, with an admission price of $15 at the door.